In 2003, Ted Kennedy tried to nudge America’s colleges and universities toward changing two of the least defensible practices in the modern admissions process. The first is legacy preferences, in which schools heavily favor applications from the children of alumni, often ahead of students with stronger academic resumes but less-well-connected parents. The second practice, early decision, where schools make it easier for prospective students to get admitted if they’ll commit to attending at the time they apply, has a similar effect, since wealthier candidates don’t need to compare financial aid packages and can therefore more easily commit to a school early. Taken together, the two practices fly in the face of the ideal of American meritocracy, and reduce the opportunities for young people of more modest backgrounds to go to selective colleges. Under Kennedy’s proposal, schools that used both tools and also graduated students of color at a disproportionately low rate—at the time, that meant eighty-seven schools, including five Ivies—would be required to try to boost that rate, and would receive federal money to do so. If they failed, the schools would be required to give up legacy preferences or early decision, or else forgo other forms of federal aid. Kennedy was touching the third and fourth rails of higher education, a particularly courageous move for a senator who represents the state with perhaps the most powerful colleges in the country. Yet as a longtime leader on education issues, who two years earlier had worked with President Bush to pass the No Child Left Behind Act, Kennedy had sufficient clout to get his measure considered, even in a GOP Congress. Indeed, the proposal held out some appeal to certain of the Senate’s Republican populists, who tend to be well disposed toward any effort to stick it to the East Coast elite. more predictability, and to lock in certain coveted applicants—often wealthy athletic recruits, who play sports like squash and lacrosse and whose parents can be expected to pay full price. Higher ed lobbyists quickly mobilized their member colleges, encouraging them to go directly to senators on the key committee. Publicly, the lobby stressed the effect the measure would have on small religious institutions and historically black colleges, some of which, they claimed, depend for their existence on using the admissions process to maintain alumni loyalty. But in reality, say Hill staffers who worked on the issue, it was the elite New England private colleges and universities, appealing directly to their home-state senators Kennedy and Chris Dodd of Connecticut, who applied particularly effective behind-the-scenes pressure. When Dodd began to waver, Kennedy was forced to back off, and the two instead proposed a largely toothless alternative that merely required colleges to report on the number, socioeconomic status, and race of students who were relatives of alumni or were admitted through early decision. It involved no penalties of any kind. Yet ultimately, under pressure from One Dupont, even this measure was never brought up for a vote. The fight to hold on to preferential admissions practices was only one example of what might be called the higher education lobby’s misplaced priorities. For years, colleges and universities have hidden behind the argument that America’s system of higher education is the best in the world to insulate themselves from scrutiny and accountability, and to operate with a remarkable degree of autonomy from Washington, given the funds lavished on them by the federal government. The claim that our higher ed system really is the best in the world, however, is becoming less and less true every year. In 1980, the United States led Canada by 10 percent in the percentage of its population with a college degree, and was ahead of the United Kingdom by 11 percent and France by 19 percent, according to a recent study by the Organization for Economic Cooperation and Development. By 2000, those leads had shrunk to 3, 6, and 10 percent respectively—and the evidence suggests that the gaps have continued to narrow since then. Meanwhile, colleges, especially elite private institutions, have been raising tuition far faster than the rate of inflation year after year after year, outpacing the meager growth in federal tuition subsidies. That’s put a squeeze on middle-class families and forced students deeper and deeper into debt. Worst of all, the information that policy makers and the public need to begin turning these problems around—which schools are educating their students effectively, and how tuition dollars are really being spent—remains locked in the ivory tower. That’s not to say that higher ed doesn’t champion righteous causes. In the 1990s, they stood up to attempts by the Republican Congress to cut student aid, and went on to team with the Clinton administration to expand the Pell Grant program. And when, after 9/11, the Bush administration, in its zeal to keep out terrorists, imposed overly harsh visa requirements that ended up keeping out large numbers of foreign professors and grad students—exactly the kind of people who keep our universities humming with fresh ideas—higher ed led the successful effort to pressure the government to adopt a more sensible policy. But the same lobbying muscle they’ve often put in the service of worthy causes they’ve also used to thwart promising reforms. On a range of issues, higher ed has stood up for its own narrow strategic or pecuniary concerns, rather than the broader interests of students or the country at large. In short, though it represents institutions that loudly proclaim a mission of public service, the higher education lobby more often acts like any other Washington trade group. Today, one of the most significant roadblocks to fixing many of the pressing problems of our troubled system of higher education is the higher education lobby itself. Though organized associations of colleges and universities have been lobbying the federal government on behalf of their interests since the nineteenth century, it wasn’t until the 1950s that higher education began to exert influence in Washington in a systematic way. The GI Bill and the spreading prosperity of the postwar years helped create a society in which a college degree for the first time became a common middle-class aspiration. As higher education became increasingly central to American life, its Washington representatives began to work together to take advantage of this growing prominence, and to ensure that colleges and universities were getting their share of federal spending. In 1968, the American Council on Education—which represents both public and private universities as well as smaller regional and national associations, and bills itself as the “unifying voice” of higher ed—took over One Dupont and established it as the lobby’s power center. But there was trouble on the horizon. The political unrest on college campuses in the late 1960s provoked a conservative backlash. Concerned that the federal government would react by cracking down on colleges’ historic autonomy, higher ed stepped up its Washington presence. Nonetheless, in 1972 it suffered a major legislative defeat: the Democratic Congress was considering ways to help expand access to higher education, and colleges advocated an approach by which they would receive aid as institutions, which would then allow them to offer tuition breaks to poorer students. But instead, Congress created federal grants that would be given directly to college students, to use at the school of their choice. (The program, conceived by Democratic Senator Claiborne Pell of Rhode Island, now bears his name.) Many in higher education circles blamed the defeat on a lack of lobbying sophistication. As a result, in 1976 a coalition of private schools founded the National Association of Independent Colleges and Universities (NAICU), with the explicit purpose of lobbying the federal government more effectively. During this same period, the federal government’s role in higher education began to increase, as Washington started subsidizing research more heavily, and regulating aspects of college life that had heretofore been seen as the exclusive purview of the institutions themselves—from the gender equity of their sports programs to the safety of their campuses. In response, higher education continued to beef up its lobbying presence. Then, in 1994, the Republican takeover of Congress brought to power a new wave of leaders with an essentially antagonistic attitude toward higher education as a whole, triggering a countermobilization by the lobby. With the Clinton White House as an ally, it successfully fought off Newt Gingrich’s efforts to gut federal student financial aid, and helped block a bid by then Senate Majority Leader Bob Dole—who was looking to burnish his conservative credentials in advance of his presidential run—to eliminate affirmative action programs. Over the next few years, the lobby won steady or increased funding for almost every key program. But it also learned how to use its growing Washington know-how to work not just against Republicans but with them, when doing so served its interests. For instance, in the early nineties, the Democratic Congress had created a system to allow the Education Department to audit the finances of colleges that triggered warning signs of mismanagement. Resenting this challenge to higher education’s autonomy, NAICU skillfully framed the issue as a case of big government run wild, and in 1995 teamed with Gingrich and his conservative acolytes in Congress to eliminate the program. The higher ed lobby is plenty aggressive, but in an understated way—money is not its main lever of power. In 2005, the last years for which figures are available, higher education associations officially spent just $6.2 million on lobbying, according to figures from Inside Higher Ed. (By contrast, General Electric alone spent $24.2 million, much of which went to the kind of high-priced outside law and PR firms that higher ed almost never employs.) Nor does it rely on mass grassroots campaigns to make its voice heard. Since most of the associations are organized under the tax code as 501(c)(3) organizations, they’re legally allowed to spend only a limited amount of money on the kind of conventional mass political tactics—holding rallies and organizing letter- and e-mail-writing campaigns in order to affect legislation—that the teachers unions or environmental groups routinely use. Instead, higher ed wields power in two effective if subtle ways. First, it plays an inside game, conducting quiet, sit-down meetings with policy makers in which it trades on its expertise on the often technical questions of education policy. Hill staffers looking to make sense of complicated legislative proposals, and to understand the impact on those most directly affected, have little alternative but to turn to higher ed lobbyists. Second, higher ed makes skillful use of its hometown ties. Colleges typically occupy prominent positions in the economic, cultural, and civic life of their communities, and they’re adept at using those positions to win influence. They can curry favor with legislators by conferring honorary degrees or inviting them to give commencement addresses, usually generating a round of positive PR back home. In some communities, college presidents are high-profile public figures, with ready access to the media and the power to help shape local opinion. Like large corporations, universities are often major employers in their districts, and their financial fortunes have a spillover effect on the local economy. More personal ties can also weigh heavily: according to some Hill staffers, legislators often have a soft spot for their alma mater, or for the state university whose football team they grew up rooting for. ACE President David Ward, who served on the commission, told me he found this first version “unnecessarily polemical and confrontational.” Not wanting to alienate higher ed, whose cooperation would be needed to implement the proposed reforms, the other commissioners acquiesced to changes in the report’s language, in response to higher ed’s complaints. Nonetheless, some on the commission were shocked by the lobby’s utter resistance to the inclusion of any forthright criticism. “It was the closest thing I’ve seen to censorship in my life,” says Miller. In the final, public version, the reference to mediocrity was gone, replaced by this more diplomatic statement: “Among the vast and varied institutions that make up U.S. higher education, we have found much to applaud but also much that requires urgent reform.” Still, Ward refused to sign the final report. If higher ed’s reaction to a nonbinding report that merely sought to identify strategies for improvement provoked charges of censorship, it isn’t surprising that the lobby has been even less willing to compromise when Washington has actually tried to legislate reform. For decades, education experts have been concerned about declining teacher quality in K-12 schools, and in the late 1990s the Clinton administration tried to address the problem by improving colleges’ notoriously lackluster teacher-training programs. The Education Department put together a proposal requiring states to report the percentage of teacher-training-program graduates from each school who pass the state licensure exam, and to report which of their education schools, many of which are affiliated with major universities, were underperforming. Schools that consistently failed to produce graduates capable of passing the exams would lose their eligibility to receive federal aid for teacher training. This time, higher ed lost, and a version of the proposal passed Congress. But the lobby didn’t give up. During the department’s rule-making process on implementing the law in 1999, lobbyists showed up at every meeting with complaints and objections, watering down the effect of the legislation. In addition, higher ed mobilized at the state level, prevailing upon state governments to set absurdly lenient testing standards—in some cases, schools essentially avoided compliance by simply defining a “program completer” as someone who had passed the licensing exam, ensuring a 100 percent success rate. Nine years after its passage, most experts agree the law has done little to improve teacher quality. This arrangement creates an obvious incentive toward corruption, and over the last decade evidence began to mount that lenders and financial aid officers at some schools were building improperly close relationships. When the Clinton administration tried to look into the issue in the late 1990s, the higher ed lobby showed little interest. Only in the last two years, when outright corruption became undeniable, did higher ed get behind anything that might hurt the lending industry. And even then, it hardly went out on a limb, backing legislation—the College Cost Reduction Act, which passed both houses of Congress in July—that merely cuts subsidies to lenders, and that already had massive bipartisan support. What they didn’t do was get behind a more far-reaching approach when they had the chance. Last February, legislators from both parties proposed the Student Aid Reward Act (STAR), which sought to encourage schools to choose direct lending over private lending, by allowing them to keep three-quarters of the savings that direct loans generate—to be spent on additional Pell Grants for their students—with the remaining one-quarter going to deficit reduction. Schools that continued to participate in the lender-based program would face no penalty. In other words, schools would receive free federal money for Pell Grants, or would get increased leverage in negotiating with private lenders for a better deal. One might expect, then, that the proposal would have received the enthusiastic support of the higher education lobby. But none of the Big Six associations (see “The Higher Ed Lobby: A Glossary“), and very few of the smaller lobbies, came out for STAR, much less put their political muscle behind passing it. “The silence was deafening,” says Michael Dannenberg, an education expert at the New America Foundation. Without higher ed pushing back against the deep-pocketed lenders’ opposition to STAR, it went nowhere. Perhaps higher ed was politically shrewd not to alienate their sometime allies in the lending industry on this one. But there’s no doubt that their hands-off approach worked to benefit the lenders—who Dannenberg calls “some of the worst actors in the higher education system”—at the expense of the students who are denied extra Pell Grants, and the taxpayers who continue to foot the bill for corporate subsidies. But perhaps the most damaging example of the lobby standing in the way of efforts to improve the system involves its opposition to efforts to make public more information on educational outcomes. 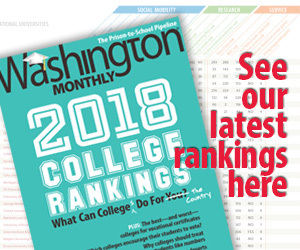 Currently, colleges report schoolwide statistics on tuition and graduation rates to the federal government, but they’ve resisted providing Washington with more student-specific information. Last year, the Education Department recommended to Congress that it address this problem by passing a law to create a single federal student-unit-record system. But though one major higher ed group—the American Association of State Colleges and Universities, which represents the less prestigious, more regional public schools—supported the idea, many of the associations went into overdrive to fight it. Their chief argument against the proposal was that such a system could violate student privacy. But that position doesn’t withstand even gentle scrutiny. The federal government routinely gathers far more sensitive personal data on private citizens—every year at tax time, for instance—but uses standard privacy protections to ensure that the information remains confidential. And the database would have been managed by the National Center for Education Statistics, a quasi-independent division of the Department of Education that has an excellent track record of protecting personal information. Again, many higher ed experts say there are more self-interested reasons for the lobby’s opposition. A student-unit-record system would lay bare some of the tricks of the trade that higher ed would just as soon keep under wraps. First, it would make public just how much aid many institutions give to academically strong middle- and upper-class students, simply to encourage them to attend and thereby boost the school’s academic ranking in college guides like U.S. News’s. Perhaps more important, the system would undercut higher ed’s longstanding efforts to keep the federal government out of the business of regulating college tuition in order to deal with the growing problem of college affordability. As average tuition has continued to rise since the early ’90s, making college increasingly unaffordable for students from low-income families, the lobby’s chief argument against federal regulation is that, thanks to financial aid and scholarship programs, many students—more than half, at some schools—don’t pay the full “sticker price.” And since no one knows exactly how much they do pay on average, the government shouldn’t try to intervene based on incomplete information. The existence of a record system would fix this problem by giving the government that information, paving the way, higher ed fears, for the feds to regulate tuition rates. It would also reveal to students that many of their peers don’t pay full price, making those who do pony up the full rate less willing to keep doing so as costs rise, according to some experts. As a result, when the student-unit-record system came before Congress, it stood little chance. With senators pressured by higher ed—one-third of the members of the key committee were from the private-college-heavy Northeast—the writing was on the wall. In the end, not only did the proposal fail to make it out of committee, but the Senate went on to pass a measure flatly prohibiting the creation of such a system. That the higher ed lobby acts in the narrow self-interest of the industry it represents is not, in a way, a big shocker; all lobbyists do this. Many Americans, however—liberals especially—expect a little more from the Washington representatives of colleges and universities. These are the institutions, after all, that are in loco parentis for their children. And they enjoy a nonprofit status that should oblige them to weigh larger societal interests more heavily in their calculations. At the very least, it would be wise for higher ed to consider that acts that seem to be in their self-interest today may not be in the long run. The public’s tolerance for the status quo is wearing a bit thin, and some in Washington are pushing radical action. A cautionary example helps prove the point: in 2003, California Republican Representative Buck McKeon offered a bill to withdraw federal student aid from colleges that raised tuition at a rate greater than inflation for three straight years. The measure played well with some angry parents, but it amounted to a form of government price control—a blunt and seldom effective instrument, and a curious one for a Republican to be proposing. That effort died in committee, but efforts like McKeon’s could become commonplace unless colleges and universities begin to modify their knee-jerk opposition to reform. Being responsive to the public doesn’t have to mean being micromanaged by Washington. Instead of imposing price controls, the federal government should demand, and colleges should accept, the disclosure of key information—like what colleges are spending money on, and how well they’re teaching—so that it can be made available to ordinary citizens, who can then decide what to do with their own tuition dollars. Doing so would create market pressures on universities to cut costs and increase the quality of their services. That won’t necessarily be pleasant for the higher ed sector, but it may make voters more amenable to increasing subsidies on things the higher ed lobby cares about, like research and student financial aid. If America’s system of higher education really is going to continue to be the best in the world, its Washington lobbyists will have to spend a little more time thinking about what’s best for America. Ben Adler is the editor of CampusProgress.org, at the Center for American Progress. The views expressed here are his own.